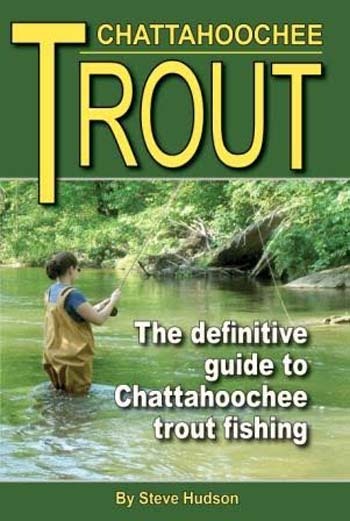 “Chattahoochee Trout: The definitive guide to fishing for trout in Georgia’s Chattahoochee River” was a year in the making, took seven months to write, and will be available at a fly shop near you, from Amazon or the publisher’s website – soon (scroll down to link). The Tug is the Drug catchphrase is associated with the author Chris Santella (Fifty Places To Fly Fish Before You Die). 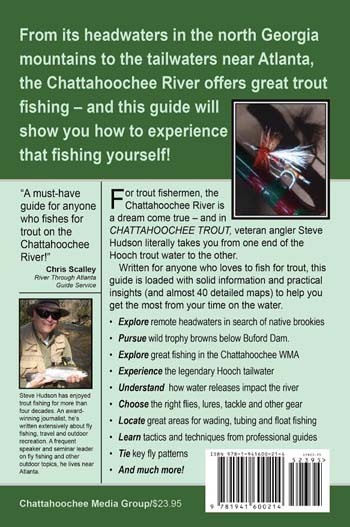 Steve Hudson, the author of more than 20 books of a regional kind, is a quintessential functionary of the “Tug is the Drug” because he is the most passionate and self-schooled trout angler ever to have set foot in the Chattahoochee River. His river, the “Hootch” is a melting pot of pescadoes that runs 430 miles with tributaries emptying into the Gulf of Mexico (Flint and Apalachicola rivers). It has more than 45 miles of barely interrupted trout water, and that is unique to this world. It begins in the oldest of mountain ranges in the world, the Appalachain’s – offering at its fountainhead waters of the “First Fish,” a psychedelically painted native brook trout. Salvelinus fontinalis gives way to a self-sustaining population of untamed XL rainbows (Oncorhynchus mykiss), happy to oblige stocked and quick to thicken rainbows and an imposing independent community of often double digit wild browns (Salmo trutta). Hudson’s Chattahoochee Trout book is one man’s journey from the rivulets of a river’s source to the length of its trout producing waters. Waters that have every kind of original run a river can have, but suffering the added imposition of being interrupted by dams. Dams create tailwater fisheries which are a whole new trout fishing experience – one well explained by the author. Steve stays away from the most popular, but under serving temptation, as well as self-dating, X marks the spot. Instead, he helps the reader/angler find where and how to approach each of the many “sections” of the river by land or vessel. He includes all the armaments needed. Hudson quickly notes, as trout anglers with miles of rubber spun on their rods already know, last year’s X spot probably isn’t this year’s honey hole. Storm washouts and outfalls (trees and rubble) change the locations of food sources. Although Steve’s book addresses would be DIY anglers, he points the way to embracing guides. He enlisted them to help complete Chattahoochee Trout, and he has fished the length of “Hootch” since childhood. Guides know where the fish are honey holing – they fish in the “now” world every day, not one weekend a year. It is not a textbook, but similar – just a lot more interesting if you’re a serious angler. The history, the river journey broken down by sections, types of angling for each section, and detailed access point mapping. He takes you on the Chattahoochee for the first time, even if you have fished it many times before. He hands over techniques, the bugs, and a toolbox you’ll need for whatever section of the river you’re planning to fish. If you tie at least at an intermediate level, there’s a goldmine of go-to fly recipes to copy down. There is no month by month bug chart. Better, a bug ID chart. If it looks like this (chart has images) and that’s what you see all over the place, it’s a blue-winged olive mayfly, for example. So, you fish a matching sized blue-winged olive mayfly – Voilà. However, there is a month by month tailwater hatch chart – tailwater activity is predictable because of a consistency of temperature. For more information go to Chattahoochee Media for publishing release updates. Featured Image: Scene on the beautiful Chattahoochee River, Atlanta, GA, postcard circa 1930s. A Pubic Domain image from the Tichnor Brothers Collection at the Boston Public Library. Remarkably, the “Hootch” holds more trout today than in the 1930s and following years.